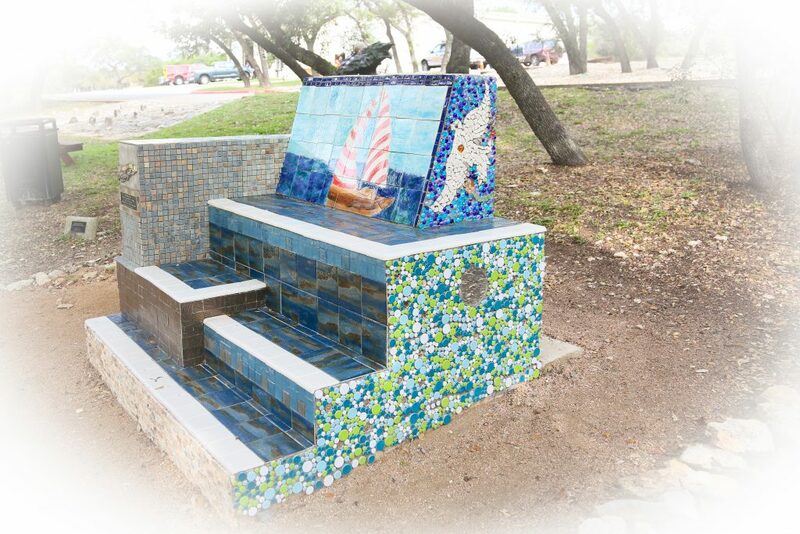 This community created park bench is titled “A Peaceful Place”. The bench sits at the top of a hill, under a canopy of trees, overlooking the pond. You see sculptures in every direction you look. This is a special place, a serene gathering place for family and friends where you can enjoy the art and nature around you or sit and chat with the kids as they explore all the fun designs on bench. This collaborative community project was initiated by the Bee Cave Arts Foundation with the idea of creating a one of a kind mosaic bench for the park. Architectural plans for the bench were provided by a local architect and The City of Bee Cave provided the funding to build the concrete structure for the bench . The Bee Cave Arts Foundation then enlisted Artist/Educator /Member Kara Wink to teach in our new Artist–In-Education Program which was a collaboration between the Arts Foundation and the Lake Travis ISD NAHS High School students. During this program the art students learned about the sculptures displayed at the Bee Cave Sculpture Park and they collaborated on designs for the community art bench project. The Arts Foundation supplied the students with tiles and ceramic glazes to complete the project. The students then created the sailboat scene for the front of the bench. Once the student’s tiles were ready, members of the Bee Cave Arts Foundation and the high school art students with their instructor Cha Asokan came together one weekend for the tile installation in the park. Local business Designer Showroom of Austin graciously donated additional tiles for the project. It was a fun weekend for all. The Bee Cave Art Foundation’s collaboration with the Lake Travis NAHS high school students and the start of the new Artist-In-Education Program was a huge success! As a gift to Board member Deby Childress, this bench “ A Peaceful Place” was dedicated to the memory of her father Ray Mitchhart and brother Brad Mitchhart . The sailboat scene on the front of the bench depicts Ray’s favorite pastime and the many weekends/vacations the family spent together on the lake. The flying guitar on the back of the bench has a quote across the wings. It says “ The song is ended but the melody still lingers on”. This quote speaks of the men’s mutual love of playing the guitar and the families loving memories of all those songs they played. Also written on the wings are the words “Salty Dog”, Ray’s favorite song to play and sing with his twin brother at family reunions and “Rock and Roll Girl”, the title of a beautiful song Brad wrote about this loving wife. Another quote is written down the neck and around the body of the guitar. This quote is illustrated by the multitude of colorful mosaic flowers that surround the guitar. It says “If I had a flower for every time I thought of you, I could walk in my garden forever”. The white dove on one side is a messenger for love and peace and the stone tree on the other side represents the strong family ties.